Children begin learning life lessons at an early age so don’t start them off on the wrong foot by lying to them or withholding the truth. Lying to your kids about money will paint an inaccurate financial picture for them and possibly even create a lack of trust in you. For example, instead of telling your kids that money grows on trees, simply explain the truth to them at an age-appropriate level. As kids get older, they become very good at deciphering the truth. So make it a policy to be honest with them from the start and you’ll find they’ll continue to come to you for answers in the future. Start early. Just because your children may still be young doesn’t mean that they can’t understand a conversation about money. Even toddlers can learn about money. For example, take your children with you on a trip to the grocery store and show them how different items have different costs. As your child gets older, you can discuss other money topics like allowances, bills, jobs, etc. It is normal to feel uncomfortable talking about finances with your children but this should not keep you from avoiding the topic completely. You are encouraged to talk about the money you make, how you spend it/save it, etc. with your kids. This will give your children a better perspective about how you manage your money and set the expectation that they will need to do the same in their lives. You can’t rely on your kids’ teachers to teach them the importance of financial literacy. While teachers may be trained in instructing about the literal value of money, the nuts and bolts of financial literacy should be taught at home based on your family’s financial situation and beliefs. While online banking has its advantages, parents are missing out by not visiting the bank in person with their children. Taking your child to the bank with you is a wonderful teachable moment. You can explain how banking works, give instruction on completing a transaction, etc. Participating in this activity with your child shows them how money has to go in to the bank before it can go out. Children are bombarded daily with media messages about having more, being better, and competing with others. They learn on their own how to envy their friends’ toys, electronics and other possessions so don’t model that behavior at home by verbally comparing your financial situation, or possessions with others. Coveting other peoples’ things is a bad character trait. Instead, remind your children (and yourself) frequently how blessed you are by the things that you DO have and how you’ve worked hard to achieve those successes. Complaining about your job in front of your kids can give them a bad impression about work. A University of Michigan study found that parents’ feelings about their own jobs play a vital role in whether their kids see work as a job, a career or a calling. You’re going to have days where you just want to complain about work. If you need to vent explain to your kids that it’s normal to encounter challenges on the job (just as they may in school). However, try to follow up with a positive comment, such as the fact that you have a job versus being unemployed, homeless, etc. We’ve all seen it (and probably personally encountered it): the meltdown from a child in a store when a parent wouldn’t buy them what their heart desired. While giving in to such outbursts will certainly quash the unruly moment it also reinforces the potential for behavior from your child in the future. Let your yes be your yes, and your no be your no. Be consistent. Hold firm to your “no” and try distracting or redirecting your child. If your child is older, explain to him/her that spending decisions are based on a budget, not on a whim or a meltdown on their part. Make chores about being part of the family, not about earning money. Your kids live in the family home, and with that comes the responsibility of completing tasks that they should naturally be doing – like making their beds, feeding their pets, emptying the trash, etc. If you desire to pay your children an allowance, here’s an alternative idea: Pay a flat 50 cents or $1 for every year of age — so a 10-year-old kid would receive $5 to $10 per week in allowance. Only reward them with additional money for going “above and beyond” like volunteering to do yard work or doing the whole family's laundry. According to a CreditCards.com survey, more than half of young people use plastic over cash — even for purchases totaling less than $5. Keep your kids cash-only so they learn how to properly budget. Wait until your child is in college to consider introducing him/her to credit cards (if at all) and reinforce that they should only charge what they can afford to pay off in full each month. The Internet is overflowing with valuable tools you can use for teaching your kids about money in a creative way. But also be sure you actively engage in talking to your kids about money. A great place to start is with our Money Management Certification Program™, which combines a 60-page step-by-step workbook with a fun online money management application for kids. Kids that complete the 2-month program develop key money habits that will benefit them the rest of their lives. The FamilyMint™ Method increases your child’s understanding, confidence, and success in saving and managing money. 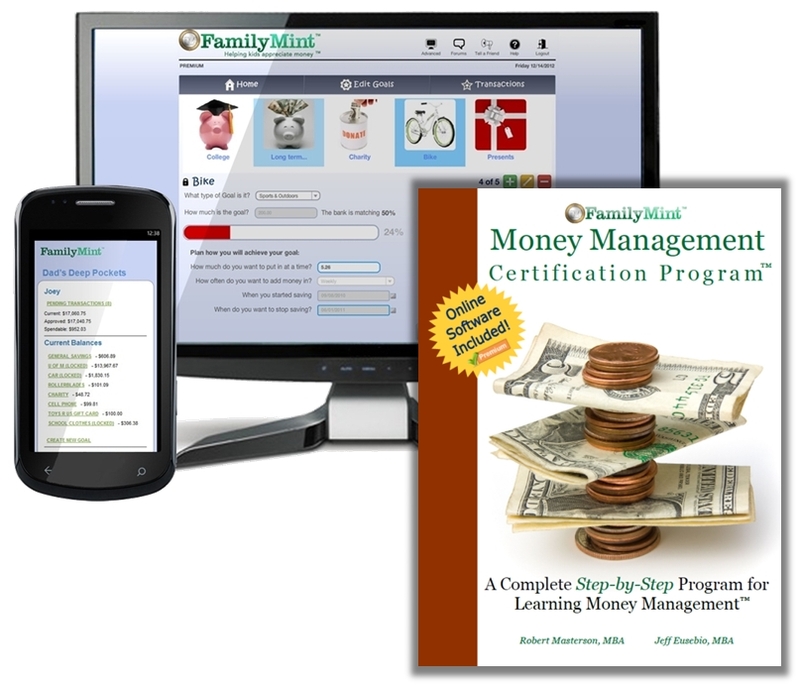 FamilyMint™ encourages parents and children to learn about money together. They also believe that the best teacher is experience, and with FamilyMint™ kids learn by setting and working to achieve goals they create themselves.